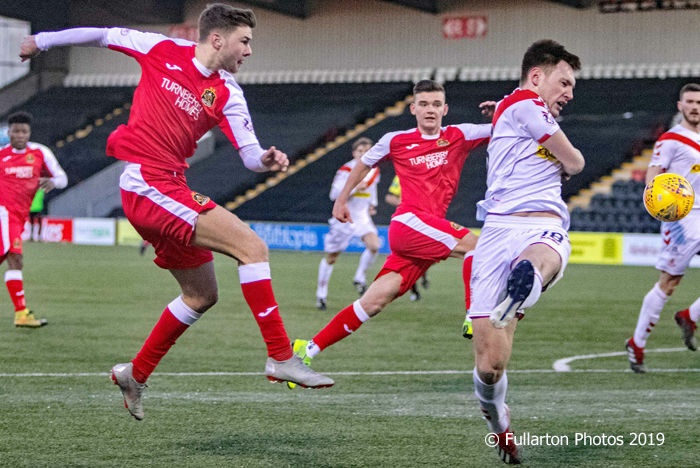 DUMBARTON deserved to take a point when they faced Airdrieonians at the bitterly cold Penny Cars Stadium. They twice came back from behind to take a point in a tough 2-2 draw in front of a 729 crowd. It was a poor start for Sons, as keeper Grant Adam pushed away Scott Stewart's initial shot, but Darryl Duffy was first to the free ball. He tapped home to give Airdrie a lead in the the first minute. The visitors pressed for much of the first half, while continuing to look vulnerable to breakaways from their opponents. There were several scrambles in the area as a result. The first ten minutes of the second half were an untidy affair. Then suddenly Dumbarton were back in the game. As Sons broke on 55 minutes Dom Thomas fed the ball out wide to Bobby Barr, who crashed it into the far corner of the net to make it 1-1. However, on 63 minutes Leighton McIntosh put the hosts ahead for the second time, after being sent through on goal by a quick pass. Dumbarton went back onto the attack. But it took two fine saves from Adam to prevent Airdrieonians from going two in front. Then just as it looked looked like defeat, Sons snatched a second equaliser as Dom Thomas (pictured) struck a beautiful angled shot in for 2-2, after being set up by Ben Armour. Dumbarton threw everything into finding a winner, but could not quite manage it.